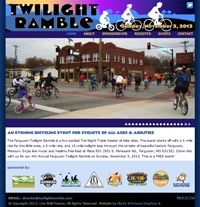 This website for the annual Ferguson Twilight Ramble bicycling event features a fun rotating slider on the front page that mimics the turning of a bicycle wheel. Participants can register for the free event using an online registration form. Sponsors can also submit their payments online.